Writers’ groups are a source of support, inspiration and motivation for their members. One project that many writers groups undertake is to bring out a compendium of their members’ work. Compass Writers, a volunteer-run community writers’ group that has been running in Waterford, Ireland since 2007, is just about to publish its first collection of members’ work. I chatted to Jim Lawlor of Compass Writers about the highs and lows of putting together a group work and organising the launch event to go with it. OS: Jim, you are one of the main organisers of Thursday night’s launch of Compass Writers’ new book, “Between Water, Land and Sky”. Fans of Compass Writers will know that the book and launch have been in the planning for the best part of a year now. Can you give us an idea of what we can look forward to at Thursday night’s launch in the Tower Hotel? JL: I’m one of several Compass Writers that have been putting many hours into the book and the launch over the last while. As launch night approaches, the number of people directly involved has been growing quickly. As for the launch itself: On Thursday December 8th, the evening will kick off at 8 pm sharp in The Tower Hotel, when the Deputy Mayor of Waterford, Mary Roche, will introduce the event, and then poet John Ennis will launch the book. This will be followed by readings from the book by group members. At least as importantly, there will be tea, coffee, biscuits and cake for those in attendance, and spot prizes will be raffled at the end of the evening. I’d expect the formalities to last for about an hour and I’d hope that everyone will enjoy themselves. Last but not least, books will be on sale on the night. Buying local is more important than ever this Christmas, and we hope that the book will find its way into many Christmas stockings! OS: Let’s talk about the process of putting together a book like this. What are the particular challenges of putting together a compendium like “Between Water, Land and Sky”? What are the benefits for the group? Do you have any advice for other writers’ groups who may be considering a similar project? JL: Well… how long have you got? I’ll try to keep it as brief as possible. First of all, the sheer range of people involved poses challenges. We have ten Compass Writers directly involved in the book, and this includes poets, short story writers, memoir-writers, and those reporting on factual events. In other words, we have all styles and preferences in writing represented. Once the pieces each writer was contributing to the book were decided, we broke up into critiquing pairs. While constructive criticism is a staple of Compass Writers – just as it is in any writing group – one-on-one criticism of personally-favoured pieces is still a challenge. But getting through this – before you even get to the stage of publishing the book – is a strong learning experience for the writer. Second, the dynamics of transforming the gathered material into a book and dealing with the publishing process had to be managed. While many Compass Writers have been published before, few enough of us have actually had books published and this was a great learning experience about the logistics of the activity. Everything from organising a sequence of contributions (alphabetical), getting an ISBN, writing a back-cover ‘blurb’, dealing with proof-reading errors, integrating the pictures and sketches (there is some artwork in the book also), choosing the font and paper, finding a printer, scheduling the printing and the launch… there were endless details. Oh, and don’t mention coming up with the costs involved. Third (I’ll stop after this) – the costs (I know what I said – I know – but they have to be covered). Compass Writers are pleased to acknowledge the grant from Waterford City Council, without which achieving publication would have been much more challenging. Compass Writers also garnered a substantial amount of sponsorship and provided a degree of funding from within the group. Finally, the launch night itself…. ah, that’s the next question! OS: Once the book itself went to the publishers, Compass Writers had to get stuck right into the process of organising the launch, which is a project all of its own. How has the group managed the organisational side of the book launch? Again, are there any particular challenges in organising a book launch where a group is involved? JL: Because there are ten Compass Writers directly involved in the process, it is difficult to keep the workload even among them all. But everyone is involved, from ensuring that their friends and acquaintances are invited, to sourcing spot prizes, to collecting books (they have been printed and are now sitting in a time-locked vault in a little-known secure facility located somewhere on the inner ring-road. Well, they’re in someone’s kitchen), to dealing with the Tower Hotel, to organising complimentary copies for sponsors, to inviting John Ennis and the Deputy Mayor, Mary Roche, to contacting the newspapers, to doing this interview (! ), to getting a photographer, to…. well, you get the idea. Did I say something earlier about lots of details? But this work is quantitatively different from organising the book. While the book experience was a strange roller-coaster ride, it at least had the reward of involving our own creative work. The launch itself has had few such consolations… so far. But I’m optimistic that the event will be thoroughly enjoyable on the night. In summary, the book launch, the publishing process and the various details associated with these activities – they all take a great deal of commitment over an extended period by a group of people. They also require patience when these people occasionally disagree on how to progress. But we are certain that the hours of meetings and work will be worth it in the end. It’s also important to recognise that the Compass Writers who have not directly contributed pieces to the book (not everyone did, and some members have joined more recently) have been extremely patient – especially recently, when the momentum of the publishing process and the launch night details threatened to overwhelm the ongoing work of the group. OS: “Between Water, Land and Sky” will be available for sale on launch night. How can people get hold of a copy after that? JL: The phrase ‘All Good Bookstores…’ comes to mind, but of course even the act of getting the book into bookstores is another job of work for the group members. I recommend that those sophisticates (well, they obviously have good taste) who would like a copy of “Between Water, Land and Sky” should go to The Book Centre in Waterford City or Ardkeen Quality Food Store on the Dunmore Road as their first port of call. I wish them much enjoyment in reading it. OS: Thanks Jim and best of luck with the book and launch! 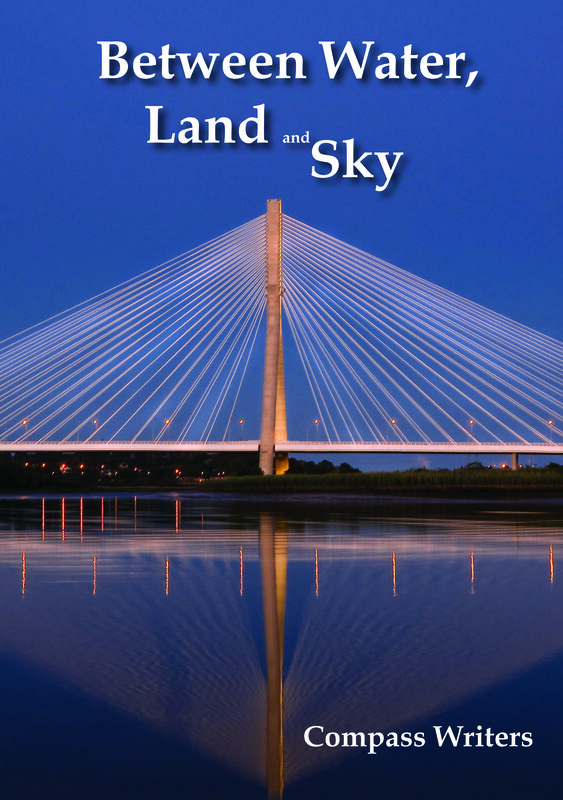 The inaugural Compass Writers compendium of members’ work, “Between Water, Land and Sky”, is available at The Book Centre, Waterford, Ardkeen Quality Food Stores, Dunmore Road, Waterford, and on launch night: 8 pm, Tower Hotel Waterford (entry free, all welcome). Support local artists and buy local this Christmas! Posted on December 7, 2011, in Writing. Bookmark the permalink. Leave a comment.